We have known air pollution kills lots of people, including as many as 1.5 million each year in China, with 400,000 early deaths in the EU, and as many as 7 million premature deaths a year globally. It also inflicts serious respiratory and cardiovascular disease, including asthma, on many more. Now we are learning that the risks from air pollution are more insidious than we imagined. A recent study in China found that air pollution causes a “huge” reduction in intelligence as reflected in significant reductions in test scores in language and arithmetic. On average the results showed the loss of a year’s worth of education from the air pollution, with language skills more affected than mathematics. Earlier research had demonstrated that air pollution harmed cognitive performance in students, but this study was able to show that the adverse effects were worse for the elderly, especially those over 64, and worse for men than women. So all those critical financial decisions that people make as they get older, like how to survive retirement, may be less informed that we thought. Having some problems with words and math is not the only deficit you can look forward to because of air pollution. In an observational study, air pollution has been linked to a 40% increase in dementia for people over 50 in areas of the highest levels of nitrogen oxide (NOx) in the air compared to those living in least NOx pollution. It is not only the aging population that has to worry quite a bit about air pollution. Earlier studies had linked air pollution to risks of premature births and low birth weight and other harms in unborn babies. 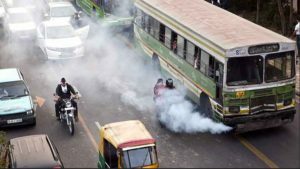 Research has now found direct evidence that toxic air travels through pregnant womens’ lungs and into their placentas. The study was of women in London. While not yet confirmed, the deep concern is that the particles can move into the foetus and affect the unborn and newly born babies. It is not like we do not know the source of what is causing these risks. Road traffic is one of the worse sources of air pollution. So this new research underlines even more the increasingly irresponsible behavior of the UK government in refusing to act according to the law to reduce this source of air pollution, as demonstrated in the long-running court battle with ClientEarth. A recent development in Spain seems timely as it can help avoid some of the effects of this air pollution. Researchers have developed an app that relies on data from air quality monitors throughout Madrid to build a mapping application that calculates the least polluted route from one location to another. But the clearer, nearly impossible, solution is simply to get rid of cars, as John Vidal has recently urged. Damian Carrington, “Air pollution particles found in mothers’ placentas: New research shows direct evidence that toxic air – already strongly linked to harm in unborn babies – travels through mothers’ bodies,” The Guardian (16 Sept 2018). ClientEarth, New clean air consultation shows UK government struggling to solve air pollution crisis (29 may 2018). John Vidal, “Want to cut air pollution? Get rid of your car,” The Guardian (19 Sept 2018). 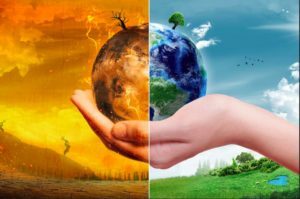 There does seem to be a growing sense, if not consensus, among the general public that climate change is for real, and is already beginning to present serious problems that will get worse over time. The extreme weather events over the past several years are a major contributor to this shift. The challenge now is how to convince the general public, and through them the political class, that something needs to be done about climate change. 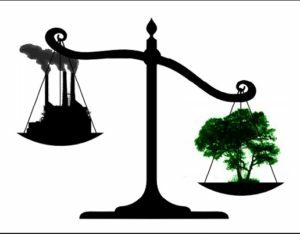 Here the battle is between mitigating climate change — acting now to reduce or eliminate the greenhouse gases (GHGs) that we emit into the atmosphere — or adapting to the effects of the climate change — waiting to see what happens and then taking action. We can argue that both are necessary, but the public is fickle and lazy and want an easier answer. They look to make a choice. 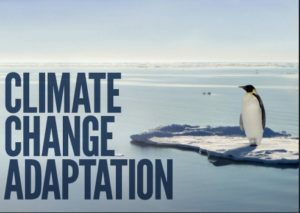 Not many of those who are deeply involved with these issues are willing to say that adaptation is the easier choice, because that has the danger of undermining mitigation. Yet there is uncertainty as to the exact depth and scope and timing of impacts from climate change that will vary from local area to local area. So, it is argued, why spend money now, to mitigate, when you can wait and see more clearly what is needed before spending the effort and resources to deal with the impacts. Of course the logic is flawed. If there is insufficient mitigation now, the warming may well exceed our ability or capacity to adapt. It will be too late. With sudden-onset tipping points, and gradual impacts, there may not be enough money to get us out of harm’s way. The critical question is: Who is “us”? Who do we get out of harm’s way? Well, first of all, ourselves, and those we are close to or identify with — our family, friends, colleagues, fellow citizens. When confronted with the threat that small island nations might be wiped out by sea rise, a George H. Bush administration supporter glibly suggested, “What’s wrong with a bit of sea level rise? It is merely changing land use—where there were cows there will be fish.” Those whose lives and cultures will be destroyed by even a slight rise in sea level would think otherwise. Note 1. But even the developed, rich societies are going to have to face the reality that some parts of their own communities will, like the developing countries, need help to get out of the way. Here’s an example. In Sweden, the indigenous Sami herders depend on the reindeer for their food, clothing and tools — the reindeer are a deep part of the Sami culture —and the reindeer depend on lichen as their primary food source. Lichen is a unique organism that takes its nutrients from the air; it also does not shed tissue. The reindeer have been subjected to environmental threats in the past. In the 1960s, there were concerns about the radiation fallout from nuclear bomb tests on the reindeer. Then in 1986 the radioactive clouds spread from Chernobyl across Europe. Particularly hard hit by fallout from rain was northern Sweden. 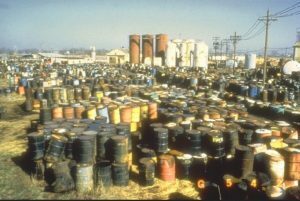 In the fall of 1986, following the seasonal slaughter of the Sami reindeer, it was discovered that the carcasses contained dangerous levels of radioactive contaminants. A typical Sami family ate reindeer meat six to eight times a week, with a total average weekly intake of two pounds. Given the elevated level of contaminants, each Sami would be subjected to a dose of radiation one hundred times the recommended safe level. The Swedish government intervened and purchased that year’s supply of reindeer meat, but this measure did not solve the long-term problem. Several generations must pass before the lichen is completely cleansed of the radioactive contaminants. If the authorities enforced a permissible level of 300 Bq/kg of radioactive substances in reindeer meat, a substantial portion of the Sami reindeer would have had to be destroyed. Sami culture depended on the reindeer, so rather than destroy the culture by destroying the reindeer, Sweden simply raised the permissible level for cesium to 1,500 Bq/kg. Although at first blush, this solution might be seen as absurd or dangerous to the health of the Sami people, there was a precedent to the decision. The permissible level for cesium in the United States was 1,500 Bq/kg. Note 2. Thirty years later there are still elevated levels of radioactive materials found in the reindeer. 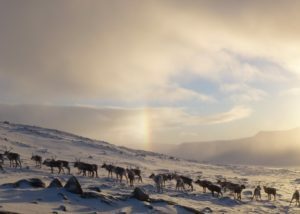 Now the Sami, and their reindeer, have to contend with climate change. Current warming and wildfires, even in the Arctic Circle, fueled in part by climate change, have destroyed grazing lands with the lichen that is critical for the reindeers’ food supply. Future climate impacts will worsen things. Warmer summers do help lichen to grow but warmer and wetter winters result in rainfall rather than snowfall in the colder months. As a result, when temperatures go below freezing, sheets of ice form instead of softer crusts of snow. 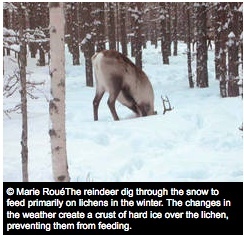 The reindeer cannot smell lichen or dig through the ice so they starve to death. Climate change represents a threat that likely will outlast even the radioactive fallout from Chernobyl. The Sami are demanding a long-term government aid programme to help manage and adapt to the current climate change impacts on the reindeer herds. But they know that these impacts will intensify if there is insufficient mitigation and that because of climate warming the culture of an entire section of Swedish life may disappear. The Sami are not going to go quietly. Nor should they. Note 1. J. R. Spradley, a former prominent member of President George H. Bush’s Commerce Department, quoted in Jeremy Leggett, The Carbon War (New York: Routledge Press, 2001), 119, and quoted in Robert Emmet Hernan, “Climate Change,” This Borrowed Earth: Lessons from the 15 Worst Environmental Disasters Around the World, published in English in February 2010 by PalgraveMacmillan and in Chinese in December 2011 by China Machine Press. Note 2. See “Chernobyl” in Robert Emmet Hernan, This Borrowed Earth (above). Trump, and other climate destroyers in, for instance, Australia, will be gone, hopefully sooner rather than later. While the US under T-Rex undermines climate change action, China and others proceed with developing the renewable and sustainable technology that will be critical over the rest of this century, and beyond. As a result, energy technology (e.g., battery storage capacity, smart meters and grids, solar and wind, maybe carbon capture) will continue to grow by leaps and bounds. Regional and local governments and institutions will continue to experiment with transportation and building practices and policies to promote energy efficiencies and renewable sources of energy. 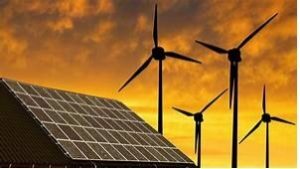 Economies of scale and lower prices for renewables are in part the result of states mandating a portion of energy resources to be renewables. 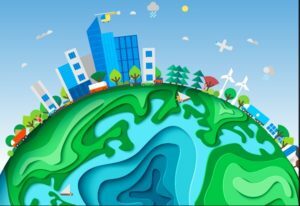 Many multi-national businesses, accustomed to operating in climate-friendly places like the European Union and California, are resigned to accepting carbon regulation and even are embracing the increasingly lower cost renewables. As we pointed out in a recent ieBLOG, big oil is making sounds like climate change progressives. A Statoil n/k/a Equiver report is pushing the view that more renewable energy is urgently needed and that “The climate debate is long on targets, but short on action.” NYTimes (Povoledo). 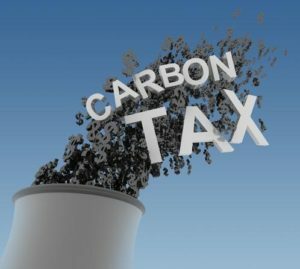 ExxonMobil has for years supported a carbon tax as a necessary and fair method for addressing carbon emissions. Even in Australia, about half of big businesses are moving toward renewables. As least 22 companies of the Fortune 500 have committed to buying renewable power to meet 100% of their electricity use. While 22 out of 500 is just a start, 100% is an aggressive target from the 22. And such action in turn drives utilities to meet these demands from some of their prime industrial customers. The next step needed is to extend such arrangements to medium and smaller businesses, perhaps by their pooling resources and uses. A recent study has indicated that the fossil fuel industry is facing increasing financial challenges. One key reason is that it now has a competitor (renewables) that can deliver the same product — energy — with cheaper, cleaner, better technologies. See McKibben. Of course there are and will be the regressive exceptions, such as the Koch Bros and industrial farming. But like T-Rex, they will also be gone some day while those who adapt to climate cost pressures will survive economically. 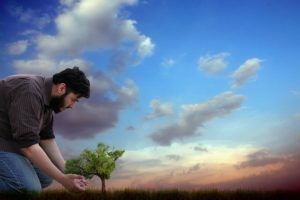 Besides enlightened local, regional and national governments, and progressive leaders of the business community, like Michael Bloomberg and many IT companies, and even some fossil fuel companies, we are also seeing religious leaders stepping up their commitment to climate and other environmental challenges. In his 2015 climate change encyclical, Laudato si: On Care For Our Common Home, Pope Francis called for a transition away from fossil fuels. The Pope is at it again, by recently bringing together at the Vatican representatives of some of the biggest oil companies. At that gathering, Pope Francis reinforced his message from Laudato si making clear that the only debate over climate change was not whether we have to transition away from fossil fuels but how long the transition will be. So while there are lots of powerful special interests that are continuing to sabotage any meaningful action on climate change, there are also some progressive voices and commitments that we need to encourage. Kate Lamb, “Preaching against plastic: Indonesia’s religious leaders join fight to cut waste,” The Guardian (7 June 2018). “How Big Oil Now Talks about Climate Change: It’s real. It’s happening. It’s dangerous. BUT…” in the ieBLOG section of irish environment (May 2018).